Legendary music icons, THREE DOG NIGHT, celebrate their 4th decade bringing with them some of the most astonishing statistics in popular music. In the years 1969 through 1974, no other group achieved more top 10 hits, moved more records or sold more concert tickets than THREE DOG NIGHT. THREE DOG NIGHT's hits wind through the fabric of pop culture today, whether on the radio where they are heard day in and day out, in TV commercials or in major motion pictures - songs like "Mama Told Me (Not To Come)", "Joy to the World", "Black and White", "Shambala" and "One" serve to heighten our emotions and crystallize THREE DOG NIGHT's continuing popularity. This Grammy-nominated band is not content resting on their legacy alone. Always working to expand their audience, THREE DOG NIGHT have embraced and been embraced by 21st century music technology. New fans buy THREE DOG NIGHT's music on iTunes as well as at record stores. 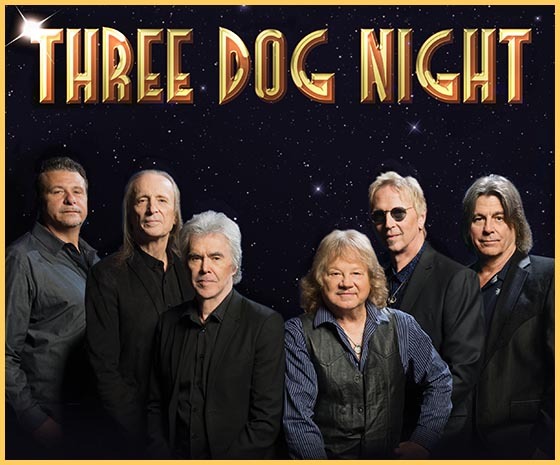 In fact, their releases from this decade alone have sold well over a million and a half albums and the band's continued popularity has landed "The Best of Three Dog Night : 20th Century Masters" on the Billboard Top 200 Album Chart for 9 of the last 12 months. Recently, THREE DOG NIGHT began adding new songs to their arsenal by releasing their first double-A sided single in nearly 25 years. For information call (706) 896-4191.